Benjamin Lytal’s A Map of Tulsa is in many ways the kind of typical first novel that creative writing courses have largely eliminated: in it a gauche young man, Jim Praley, falls in love with a seemingly unattainable young woman, Adrienne Booker, whom he momentarily seems to attain. Adrienne ticks all the boxes for such devoted affection: she has rejected the conventional pathway of college taken up by Jim to stay at home in Tulsa and paint – something she can afford to do because of her wealthy family, which she is, of course, alienated from. The novel also charts Jim’s relationship with his hometown for which he feels an inexplicable longing even while recognising a lack of belonging. Edith shooed me away, as if eager to get rid of me. Eventually she tells him she wants to go back to painting alone, seemingly ending the relationship – only to revive it again when she asks him (via a third party) to come on a weekend away with her and a group of friends. Only after that do they become lovers and spend the summer together, but the signs have been there since the beginning that what Jim regards as permanent, Adrienne sees as transitory. What initially seems Adrienne’s indifference to Jim comes to look more like Jim’s abandonment of Adrienne. He often talks about her giving him a ‘map of Tulsa’, that is showing and taking him places he would otherwise never have seen; in fact what she was mapping was his idea of himself. 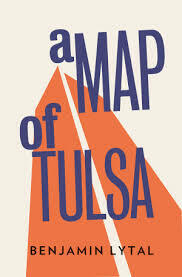 A Map of Tulsa is a readable if traditional first novel, rejecting current trends in more experimental writing for a different kind of honesty. If it has a fault it is that Lytal seems a little in love with Adrienne himself. You are currently browsing the archives for the Benjamin Lytal category.